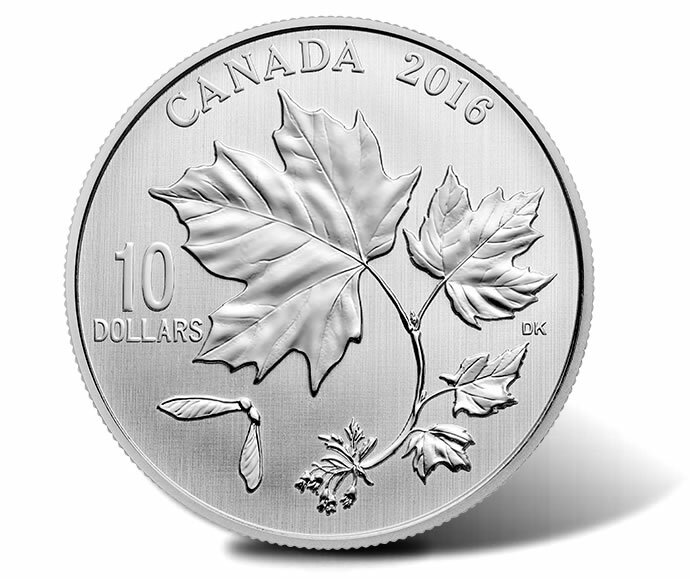 The Royal Canadian Mint today introduced its latest coin featuring maple leaves, this one in one-half ounce of 99.99% pure silver and in unique finish that combines a brilliant and frosted relief over a lined background. Its smaller size makes it more affordable at CAD $29.95, or about US $23. Last year’s issue, according to the Mint, was among its bestselling coins. It sold out at a mintage of 25,000. This year’s release has a higher limit of 30,000 coins. the deeply veined appearance of the mature leaf then gives way to the broad, elder leaf in autumn. Reverse inscriptions include CANADA, 2016 10 DOLLARS and DK for the artist’s initials. Obverses depict Susanna Blunt’s effigy of Queen Elizabeth II with surrounding inscriptions of ELIZABETH II and D G REGINA. Coins are 15.87 grams in weight, have a diameter of 34 millimeters and have serrated edge. Order the 2016 $10 Silver Maple Leaves Coin from the Royal Canadian Mint’s website at mint.ca. An affiliate link to the Mint’s produce page for the coin is right here . Each coin arrives encapsulated and within a Mint-branded presentation case and includes a serialized certificate.